Safeguarding the U.S. border, primarily the responsibility of the Department of Homeland Security (DHS), has become a contentious issue as many Central American migrants seek asylum in the United States. A battle between President Donald J. Trump and Democratic lawmakers over funding for a southern border wall led to a government shutdown and ultimately a presidential emergency declaration. Meanwhile, the deployment of active-duty troops to the southern border reflects a growing militarization of the area, though their role is constrained by U.S. law. Who is responsible for U.S. border security? Securing the borders primarily falls to U.S. Customs and Border Protection (CBP), a branch of the Department of Homeland Security. Alongside agencies such as the Transportation Security Administration and Drug Enforcement Administration (DEA), CBP is responsible for overseeing trade and travel in and out of the country. Its duties include preventing criminals, would-be terrorists, and contraband from entry. CBP’s work includes inspecting immigrants and cargo at ports of entry, patrolling thousands of miles of border to the country’s north and south, and helping investigate criminal networks. Of CBP’s more than sixty thousand employees, about one third are Border Patrol agents, who exclusively work between ports of entry. When are National Guard forces deployed to the border? The National Guard, a reserve military force deployed for a wide range of missions at home and abroad, has been called on by U.S. presidents several times in recent years to assist border agents with unauthorized immigration and drug trafficking. National Guard soldiers typically operate in their home state and can be called to action by either a state governor or the president. In April 2018, two thousand National Guard personnel were deployed along the southwest border as part of a joint operation with CBP known as Guardian Support. Their mission is to assist border agents with logistics, administrative duties, surveillance, and intelligence analysis, as well as to provide aerial and mechanical support. Roughly half of those soldiers are in Texas; the other half are in Arizona, California, and New Mexico. When are active-duty troops deployed there? As with the National Guard, it is rare for active-duty U.S. military forces to be sent to the border. 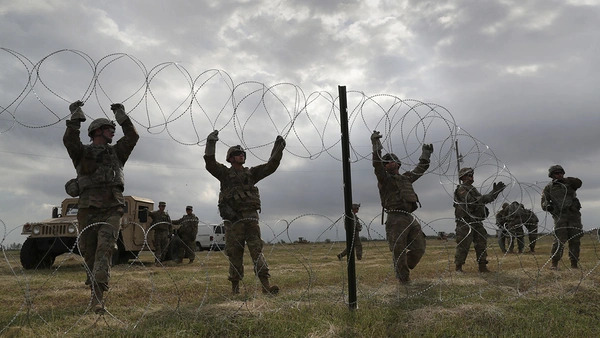 In October, the Pentagon sent more than five thousand troops to “harden the southern border,” employing them for efforts such as laying razor wire. Critics called the move a political stunt amid a midterm election cycle in which President Donald J. Trump made immigration a core issue. The 1878 Posse Comitatus Act limits the U.S. military’s role in enforcing domestic laws, meaning that interactions between these active-duty troops and migrants at the Mexican border is restricted. They can neither detain and deport unauthorized immigrants nor conduct searches and seizures. Like the National Guard soldiers, these troops will largely provide indirect support, such as conducting aerial surveillance and repairing or reinforcing infrastructure. 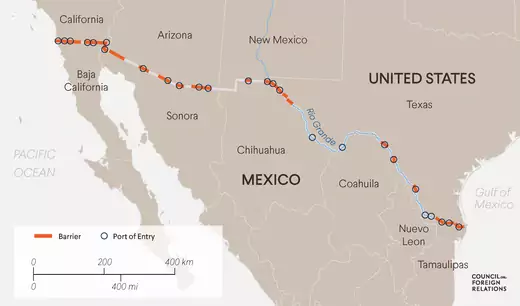 Several thousand troops assigned to the border are expected to stay there at least through January, following a request by DHS. Armed officials are generally constrained from using deadly force. Under CBP policy [PDF], agents are allowed to use force considered “objectively reasonable to affect an arrest,” taking into consideration whether a person poses a security threat or is resisting arrest; excessive force is prohibited. An agent may use deadly force only in a case of imminent danger of death or serious injury. CBP personnel face hundreds of assaults each year, with the number spiking in 2017 to more than eight hundred. According to the agency, use of force by border officers or agents that involved firearms has declined by more than two-thirds from 2012, though dozens of people—both citizens and noncitizens—have been reported killed in confrontations with agents in recent years. Where are most border crossings? The southwest border, stretching nearly two thousand miles from southern California to the southern tip of Texas at the Gulf of Mexico, has long been the area of highest concern for Border Patrol agents. Trump administration officials say illegal border crossings are at crisis levels, though the numbers have declined sharply in the past two decades. Annual apprehensions dropped [PDF] from a high of 1.64 million in 2000 to about four hundred thousand in 2018. Monthly apprehensions over the past year had ranged between thirty and forty thousand, but there has been an uptick since October. While the vast majority of apprehended individuals in previous years were Mexican migrants, an increasing number—about one in three—are now asylum seekers from Central America’s Northern Triangle: Honduras, Guatemala, and El Salvador. Rather than seeking to evade border patrols, they are turning themselves in, to enter through legal channels. They say they are fleeing gang recruitment, protection rackets, abusive police, and inept criminal justice systems, as well as poverty. Many of these Central Americans have journeyed to the U.S. border in so-called caravans, which offer a degree of protection from predation on the road and frees migrants from contracting with smugglers. The Trump administration announced in December that migrants waiting for their asylum claims to be reviewed would have to stay in Mexico, with the Mexican government agreeing to offer them visas and work permits. Some migrants have chosen to apply for asylum in Mexico, though they frequently face harm there and the country’s bureaucracy is already stretched beyond its capacity to process claims. Is there a threat to U.S. national security? President Trump and members of his administration have warned of Central American gang members and would-be South Asian and Middle Eastern terrorists joining caravans to infiltrate the United States. DHS Secretary Kirstjen Nielsen said hundreds of convicted criminals were among those traveling toward the U.S. border. The Washington Post has challenged the administration’s figures about U.S.-bound migrants with criminal histories. Trump has argued that a wall along the southern border, along with other security measures, will keep out criminals and halt the flow of illegal drugs. He called for Congress to approve more than $5 billion to fund the construction of more than two hundred miles of wall, a demand that was rejected by Democratic lawmakers and led to a month-long partial government shutdown. In February, as he signed a bipartisan spending bill that included just $1.4 billion in wall funding, Trump announced he would declare a national emergency to redirect funds from the Treasury and Defense Departments for wall construction, a move expected to face legal challenges. 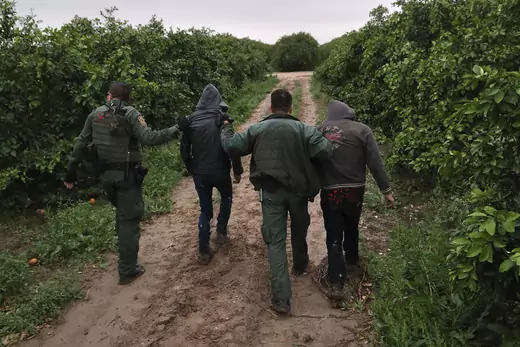 DHS reported a 90 percent decrease in apprehensions in one sector along the southern border following the installation of a border wall there. Reports by the DEA have found most drugs are smuggled at legal ports of entry or through tunnels. Why is the asylum process under pressure? 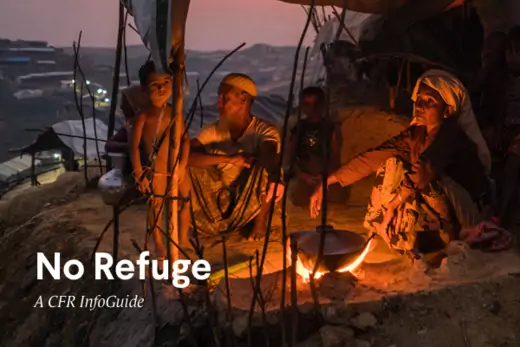 As a signatory to the 1967 protocol to the UN refugee convention, the United States has committed to providing refuge to people with a “well-founded fear of being persecuted for reasons of race, religion, nationality, membership of a particular social group or political opinion.” Applicants must demonstrate a credible fear that they would be killed or tortured if returned to their home country. The U.S. Immigration and Nationality Act makes asylum available to those already in the United States as well as those arriving at its borders. Long waits at ports of entry have driven some asylum seekers to cross at unauthorized points, and the Justice Department said they would be criminally prosecuted for illegal entry. Success rates for asylum seekers vary widely by court, but are overall quite low. Those who do gain entry face a growing backlog in the immigration courts—320,000 asylum cases as of the end of June—which has meant long waits for claims to be heard. Many who lose their cases join the ranks of the undocumented population. Trump has denigrated the legal right to seek asylum as a “loophole” in immigration policy, subject to fraud and abuse. Border crossers and asylum seekers have been detained under a blanket “zero tolerance” policy that resulted in the government separating children from their parents and keeping the children in detention; after backtracking from this policy over the summer, the administration is now reportedly considering new measures to deter would-be asylum seekers. One such measure, which would likely face legal challenge, would present parents with the choice between keeping their children with them in indefinite detention or having them placed in outside custody. Former Attorney General Jeff Sessions this year also narrowed the criteria for asylum [PDF], instructing judges that gang or domestic violence generally does not qualify as grounds for asylum, and Trump signed an executive order in November denying the right to seek asylum to migrants entering the United States outside ports of entry. Federal courts have blocked both these moves.